Housing Secretary James Brokenshire MP has today announced a new partnership with Barclays Bank to provide £1 billion of loan finance to help support small and medium sized developers, speeding up the delivery of thousands of new homes planned across England. Support, ranging between £5 million to £100 million, will be made available to those developers who are able to demonstrate the necessary experience and commitment to building excellent new homes, whilst boasting a track record of delivering challenging projects on time and to target. "My priority as Housing Secretary is to get Britain building the homes our country needs. This new fund - partnering Homes England with Barclays - is a further important step by giving smaller builders access to the finance they need to get housing developments off the ground. "This is a fantastic opportunity to not only get more homes built but also promote new and innovative approaches to construction and design that exist across the housing market." "There is a vital need to build more good quality homes across the country. This £1bn fund is about helping to do exactly that by showing firms in the business of house building that the right finance is available for projects that help meet this urgent need. "We are very pleased to be working with government to get the country building more homes, more quickly." 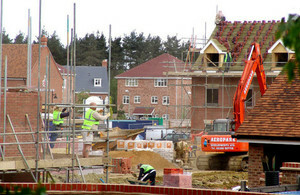 "Homes England has been established to play a more active role in the housing market and do things differently to increase the pace, scale and quality of delivering new homes. "The Housing Delivery Fund demonstrates Barclays’ commitment to the residential sector and will provide a new funding stream for SME developers to help progress sites and deliver more affordable homes across England."